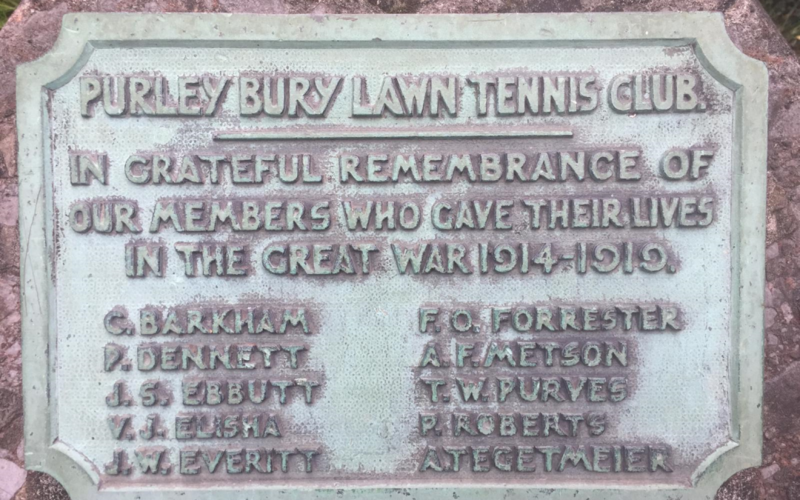 In this Centenary Year of the end of the First World War, please take a moment to think of those 10 members of Purley Bury Tennis Club who sadly gave their lives during the Great War. There is a memorial to them as you enter the gate from Purley Bury Avenue. The dates show 1914-1919, which may suggest that one of them died from his injuries after the war finished. Our teams will be playing this Sunday morning, but will break for two minute’s silence to remember all the brave souls that gave so much in conflict. We cannot imagine the effect it must have had on the club members, the relatives and the friends of those that died, as more than two members per year did not return to the courts. How lucky we are…..